There’s nothing like a healthy and hearty soup when the weather starts turning cold. 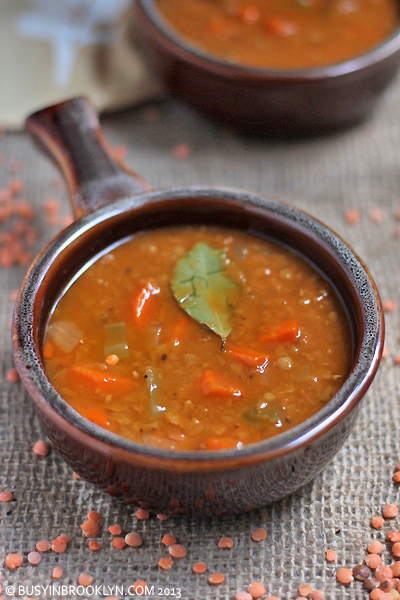 I love the texture that lentils lend to soup. They add a wonderful thickness, but they still kind of melt on your tongue. Leftover lentil soup is great mixed with pasta for lunch the next day. In a soup pot, heat the olive oil and saute the onion and garlic until translucent. Add the carrots and celery and continue to saute for 2 minutes. Add the tomato paste and continue to saute until the vegetables are coated and the paste begins to caramelize. Add lentils, broth, bay leaf, thyme, salt and pepper. 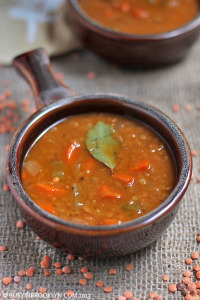 Bring the soup to a boil, reduce the heat and simmer for 30-45 minutes until lentils are soft. Remove the bay leaf and serve.